Storm team up with Prevent Breast Cancer! TICKETS: The Go Goodwin’s Manchester Storm welcome the Guildford Flames on the 10th February 2018 at 7pm, here at Planet Ice Altrincham in Elite League action! Tickets can be ordered online, by calling the box office on 0161 926 8782, or in person at the box office. 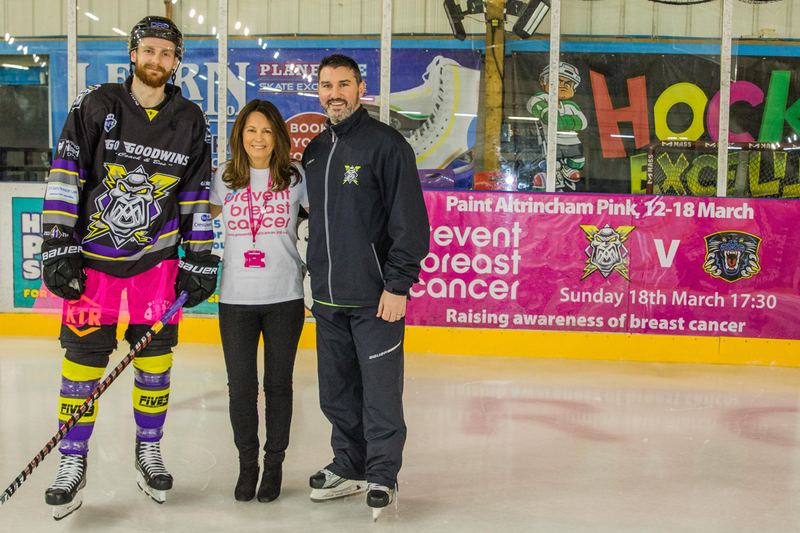 Your Go Goodwins Manchester Storm will help to “Paint Altrincham Pink” this March, as they donate the Match Sponsorship for the game on the 18th of March against the Nottingham Panthers, to the Prevent Breast Cancer charity! Prevent Breast Cancer, which is based out of The Nightingale Centre at Wythenshawe Hospital, are the only UK charity entirely dedicated to the prediction and prevention of breast cancer, and they are committed to freeing the world from the disease altogether. Unlike many other cancer charities, Prevent Breast Cancer are focused on preventing, rather than curing. Promoting early diagnosis, screening and lifestyle changes, Prevent Breast Cancer believe they can stop the problem before it starts; and being situated at the only breast cancer prevention centre in the UK, they’re right at the front-line in the fight against the disease. 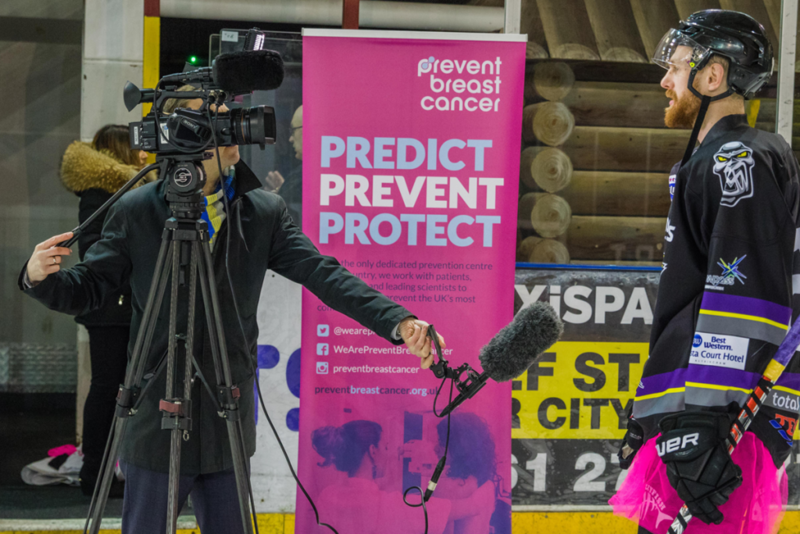 The partnership was covered by the ITV, as Mike Hall came down to interview Head Coach Ryan Finnerty, Storm’s #89 Ciaran Long, and Sarah May of Prevent Breast Cancer about how important this link up is to the club, and should hit viewers screens early next week. 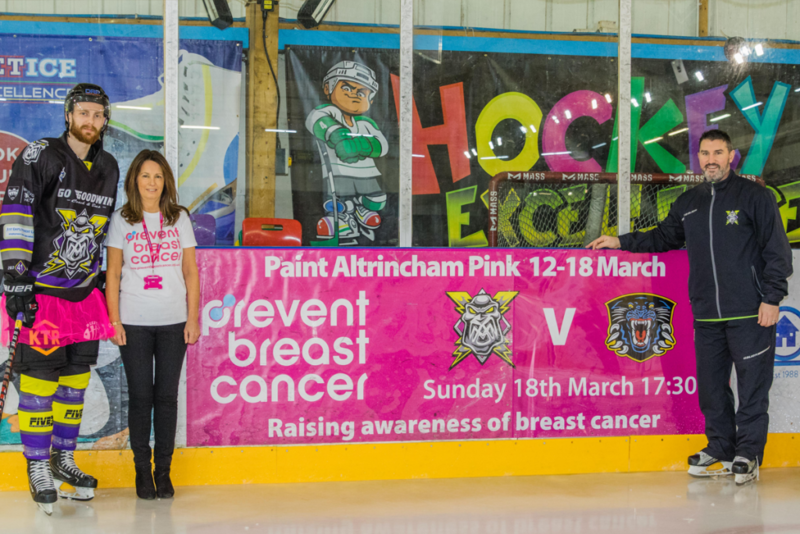 More information about “Paint Altrincham Pink” and Prevent Breast Cancer can be found HERE. Dane Byers is the EIHL player of the week!